Purchasing a car with a credit card can make a ton of sense, but it may also be the world’s worst idea. At the end of the day, the reason you’re paying with a credit card will likely dictate whether you should go through with it or not. We’ll talk about the drivers behind your decision in a moment—as well as signs it makes sense to follow through. But first, it helps to know how to pay for a car with a credit card. Is this possible? Most of the time, whether or not you can buy a car with a credit card depends on whether the dealer you’re working with will allow it. It’s possible your dealer will allow you to pay for your car with a credit card entirely if your credit card limit allows it. Some dealerships also allow partial payment with credit up to a certain limit (e.g. you can pay for the first $5,000 of your car purchase with credit). The first sign you are in good shape to charge a car to your credit card is if you have the cash to pay for your car outright. The high-interest charges rewards cards charge can and often do cancel out any rewards you’ll earn, making paying with credit a poor choice if you plan to carry a balance. Let’s say you decide to charge a car to your credit card to take advantage of a signup bonus offer. You find a dealership that lets you pay with credit and sign up for the Chase Sapphire Preferred with the intention of charging your car and scooping up the 50,000-point bonus. That’s great and all, but the interest you pay will come back and bite you in the end since the Chase Sapphire Preferred comes with a 17.49 percent to 24.49 percent APR based on your creditworthiness. If you charged a $10,000 car to your card at 17.49 percent APR and took five years to pay it off, you would pay over $5,000 in interest over that time. The bottom line: Only charge a car to a credit card to earn rewards if you can pay your balance in full when your statement closes. Now imagine you do have the cash to pay off your car right away. In that case, charging a $10,000 car to your Chase Sapphire Preferred would be of no consequence since you would pay your bill in full. On the flip side, you would earn 50,000 points worth $500 in cash-back or $625 in travel credit for the transaction. Obviously, this plan can work on an array of cards whether you want cash-back or travel rewards. 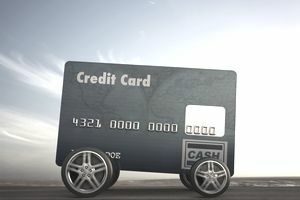 If you have the cash to pay for your car but can earn rewards for funneling the purchase through a rewards card, why not? There is one situation where it can make sense to pay for a car with a credit card when you don’t have the cash-on-hand—if you’re buying an inexpensive car and only need a short timeline to pay it off. In that case, you could apply for a balance transfer card that offers 0 percent APR and scores a short-term loan with zero interest in the process. The Citi Simplicity card is a good option to consider if you fall into this category since it offers 0 percent APR on purchases (and balance transfers) for 18 months. If the car you bought was cheap enough you could pay it with only 18 payments, charging it makes sense. Before you move forward, however, make sure to run the numbers so you know you can pay your card off before your introductory offer ends. If you don’t and you wind up carrying a balance at this card’s regular interest rate (15.49 percent - 25.49 percent based on your creditworthiness), you could live to regret it.